North of Tallahassee, Florida, Old Centerville Road is, well, old. Old Centerville and its mate, Sunny Hill Road, have been around since at least as early as the 1800s, connecting small farming communities with one another and with their markets in Tallahassee and in Thomasville, Georgia. Still unpaved, the roads haven't changed much since the introduction of the automobile more than a century ago. The land may have nurtured cotton at one time but it's home to game birds and timber now, the sole products of game plantations like Horseshoe, Cherokee, and Foshalee that line the way. Cotton wagons are gone and logging trucks are rare. 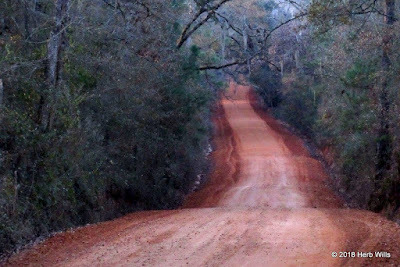 You're more likely to see a school bus, a car headed to one of the remote country churches, or someone taking the road less traveled between Florida and Georgia. On Saturday morning, 19 January 2019, though, you would have seen some 250 athletes out for a run. They were competing in either the 42nd annual Gulf Winds Track Club 30K or its junior partner, a 15K. Austin Whitelaw was the fastest in the long race, covering 18.6 hilly miles in 1:46:53. Master runner Lourena Maxwell was the first woman in the 30K, placing eleventh overall in 2:33:55. The races started at 8:00 AM from the Retreat at Bradley Pond, near a spot labeled on the map as Moccasin Gap. Austin Whitelaw, an intern with Florida State University's Athletic Academic Support program, hit the first mile in 5:27, already nearly 200 meters ahead of everyone else. Whitelaw's pace eased along the way, but he continued to leave the field behind, finishing 30 kilometers in 1:46:53 while the other runners were still making their way to the 28-kilometer mark. Charlie Johnson, a Tallahassee triathlete and two-time winner of the 30K, took second in 1:55:18. The top master runner in the race was Tony Guillen of Tallahassee, third overall in 2:09:36. Another Tallahassee master runner, Hong-Guo Yu, placed fourth in 2:13:08. While the men had been widely separated, the lead women were much closer. When Lourena Maxwell crossed the finish line back at Bradley Pond, her 2:33:55 put her just 150 meters ahead of the women's runner-up, Nikky Manausa. Manausa was twelfth overall in 2:34:41. Tallahassee master runner Tsige Tadesse was third in the women's standings and fifteenth overall in 2:39:31. Darcy Brinkman of Tallahassee placed fourth on the women's side and seventeenth overall in 2:40:35. The Leon High School cross-country team often trains on Old Centerville Road, so it was just another Saturday long run when many of them entered the Gulf Winds Track Club 15K. It was a bit faster than the usual training run, though, as they hit the first mile in 6:05 as a group with only Austin Whitelaw ahead of them. The group started to fall apart a mile later, and Leon frosh Jackson Yarbrough went on to win the 9.3-mile race in 56:27. Jackson Roberts, a Leon High junior, was second in 56:42, close enough to see Yarbrough finish. Chris O'Kelley of Tallahassee took third in 57:02, while Leon junior Joseph Ashebo was fourth in 57:48. The Leon athletes were familiar with Old Centerville Road and its hills, but Ann Centner was seeing it for the first time. "I never ran out on Old Centerville Road and Sunny Hill Road," stated Centner, a doctoral studen at Florida State University. "Back in college at the University of Georgia we used to drive out twenty minutes and run a paved road that turned to packed clay and gravel with rolling hills. But that's been a while! I liked the course today, though, I will probably go out and run it again to get in a long run." What wasn't to like? Centner won the women's competition by about a mile, finishing fifth overall in 60:09. Alyssa Terry of Tallahassee was the women's runner-up, placing fourteenth overall in 66:52. Tallahassee schoolteacher Laura McDermott was third in the women's standings and eighteenth overall in 69:09. Leon High sophomore Lilli Unger was the fourth woman and 23rd overall with a 70:38. Don Autore of Tallahassee was the first master runner in the race and the seventh male finisher, eighth overall in 62:12. Dana Black of Port Saint Joe, Florida was the first woman master and fifth in the women's standings, 28th overall in 71:43. 59 athletes finished the 2019 Gulf Winds Track Club 30K, with another 191 completing the 15K. Gulf Winds Track Club chip-timed both races. From 1979 to 1981 the race was run on Natural Bridge Road. From 1982 to February 2001 the race was run in the Saint Marks National Wildlife Refuge. From December 2001 to 2005 the race was run at Natural Bridge. starting and finishing at Bradley's Retreat in Felkel.